Last week I blogged that there was definitely going to be a strike ballot amongst support staff at London Fire Brigade. It turns out I was wrong. I wasn’t lying or turning a maybe into a definite; I was just given information that changed. After I spoke to Clive Smith at the GMB’s regional office, he and his colleagues decided that they needed to do more work to make their paperwork “shipshape”. He wouldn’t say what that means, but my understanding is the union’s membership records for LFB aren’t deemed to be 100% accurate. Which is what the British Airways strike fell foul of. If it turns out that the GMB have balloted a few members who’ve left their jobs, or even have different job types now from when their details were gathered, a court could rule the strike ballot unlawful. So they’re not taking any chances. Smith said he was hopeful that industrial action was still capable of being taken before the end of the year, if they vote for it. But it’s now December, holidays are approaching fast and the employer needs seven days’ notice of a ballot: time has almost run out. When sorrows come, they come not single spies, but in battalions. As Brian Coleman, chair of the London Fire and Emergency Planning Authority, finds his colourful remarks about the Fire Brigades Union are disapproved of upstairs, so the two other unions represented at London Fire Brigade prepare to take action in defence of their redundancy pay. (I first wrote about the likelihood of this happening earlier this month). Unison and the GMB union, who represent about 80 per cent of LFB’s 1000 or so support and office staff, served notice on their employer this week to ballot for strike action after LFB decided to cut severance pay from three weeks for every year worked to one week. The unions say this is a breach of contract; the bosses say it isn’t. The ballot should start next week and, in case of a yes vote (which they expect) the strike could theoretically be as soon as the week after that, though it seems unlikely. Meanwhile the FBU dispute remains unresolved – and the possibility remains that all three unions could co-ordinate action. Last year I blogged here about how, in a climate of austerity, engineering construction trade unions had secured an inflation-busting pay rise. Well, strike two: they’ve done it again, only in a climate of even more austerity. Workers on engineering construction sites – power stations, gas terminals, motorways and the like – will get a 4.7 per cent pay rise from 2011, it’s been announced. The deal reflects the fact that big things still need to be built – partly in the energy sector. Last year’s Ofgem report indicated there would be more capital investment, while this week three renewables firms announced they would build new factories. But there’s also the prospect of big contracts being handed out for the government’s High Speed 2 rail link and the upgrading of trunk roads. The latest industry reports show that, while orders in the sector fell last year they did not fall catastrophically, and orders are currently picking up. In engineering construction, the pay rises show no sign of abating. Kenny was speaking the day after the union held Labour Party leadership hustings, where all candidates except David Miliband apologised for one or another policy aspect of the previous 13 years of Labour government. And after Ed Balls had written an article for the Observer backing the GMB demand to subject free movement of EU labour to nationally agreed pay and conditions – the Lindsey Oil Refinery policy, if you will. Ed Balls’ Observer piece, in which he says Labour should look at the issue of migraiton within the EU with a view to tightening the rules, has caused a bit of a media flurry, as I’m sure it was meant to. But it was meant to do a bit more than that. This is exactly – and I mean exactly – what unions, notably the GMB and Unite, have been complaining about for years now, and what led to all those wildcat strikes at power station sites: that free movement of labour from the EU allows nationally agreed terms and conditions to be undermined. For the GMB it’s an article of faith that this is so. And sometimes it has been proven. So it’s not altogether surprising that this article has appeared on the eve of the GMB congress, where they will tomorrow (Monday) be hosting Labour leadership hustings. Before GMB members vote in the Labour leadership election. Not that there’s anything wrong about this, or that I don’t think Balls is sincere. But it is a pro-union propaganda hit calculated to spike his opponents’ guns. And it could well work. Sam Coates at The Times reports that Unite is already backing Ball’s stance. Incidentally, Balls isn’t attending the hustings due to other commitments. He will be at the congress on Tuesday though. For the record, it was the government of which Ed Balls was a member which allowed Andrew Miller’s agency workers bill to be killed off in parliament, and as well as delaying implementation of the agency workers directive till 2011 – the “failure” he seems to refer to towards the end – it doubled the EU’s qualifying period from six weeks to 12. Asked recently if the TUC was going to organise a general strike after more government talk of pay restraint, a trade unionist replied : “I think the TUC might go and organise a general panic”. They were joking of course, but next year is not likely to bring mass strikes. Even if next year’s Budget brings in pay and job cuts for the public sector, unions concerned will not have the luxury of concentrating their energy on fighting for jobs and pay. The PCS, with over 200,000 civil service members, is busy plotting legal and industrial action over cuts to Whitehall redundancy pay, which is expected to form its main campaign at the start of next year. Unison, Unite and the GMB have public sector members too, notably in local government and health, where pay deals are due to be thrashed out in about four months. But they also have a Labour Party to support and fund, and a general election in three to five months. I’m not saying there won’t be any public sector strikes – that would be a bit rude, it’s down to the members who vote in the end, But Unite is wary of the political implications, and I’d be surprised if the other big unions weren’t. Two places you can expect strikes in are British Airways, where the cabin crew still want their strike, and… pubs. The GMB is confident that its newly acquired pub landlord members will vote for industrial action against their pubco overlords in a ballot due to be held next month. Incidentally, the GMB, unlike many unions, gained members last year instead of losing them like many others. Speaking of British Airways, if we’re very lucky we might see the European Court of Justice deliver a verdict on unions’ right to strike vs. free movement of goods and services in the EU. Pilots’ union BALPA, whose members in BA wanted to strike last year but were prevented from doing so in the High Court, is awaiting the outcome. Oh and did someone mention Royal Mail…? Right, that’s enough, it’s Christmas Eve already. What do you mean what about the Conservatives. Go and read a proper blog why don’t you. I’ve got presents to wrap. Meanwhile here’s some Christmas cheer as we wait to come out of recession. Good night. This blog will return in the New Year. Probably. Billy Hayes, general secretary of the Communication Workers Union, can be bolshy when he wants to be, but even for him this was tough language. 1) Billy Hayes’ comments. General secretaries do not dictate union policy, but they can influence how their members vote when they vote on it at annual conference, not least through “the machine”, the army of full-time officers who are on hand to brief members (or as some see it, twist their arms into voting one way or another). Hayes will not try to stop his members voting to sever links with Labour (when they vote presently). 2) Not to be outdone, GMB general secretary Paul Kenny is threatening to cut off the constituency funding of MPs who vote for part-privatisation. Sound familiar? Yes, he’s threatened it before, as I reminded him when he was on his way out of the building. Yes, and we’ve done it before, he replied. “We’ve got a register,” he added ominously. As Labour plunges in the polls, those funds will be more needed than ever. 3) Cutting off funding to unhelpful MPs is also what Amicus general secretary candidate Jerry Hicks threatened to do when I spoke to him last week. As I hint below, there is a leftward tide in even loyal-to-Labour unions. My sources are worried about those Labour Party affiliation votes at union conferences, which get harder every year. 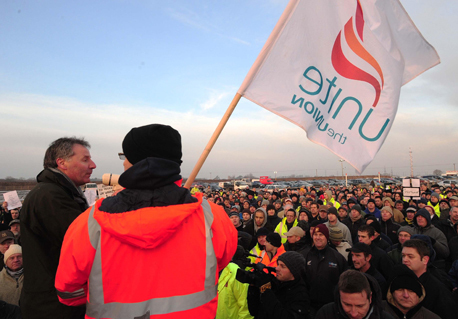 4) Relations between Downing Street and the unions have hit a new low. After all, if the government’s Warwick promise to keep “a wholly publicly owned” Royal Mail is broken, what price the whole policy-making process? Recently the No 10 political staff met with union reps to ask what concessions would encourage the CWU to drop their opposition to the government’s bill. The answer? Stop part privatisation. And the problem is partly personal: some trade unionists don’t merely dislike Lord Mandelson, but believe he is hell-bent on systematically destroying union influence on party policy. 5) It therefore follows that no amount of carrots offered by ministers will stop this loud, well-supported, broad-based campaign. 6) And finally. John McDonnell spoke at today’s rally, as did Brendan Barber. That is unusual. The two men don’t often share a platform together – the campaigns they’re associated with have in the past rivalled each other (e.g. Public Services Not Private Profit vs Speak Up for Public Services). But today they spoke as one (well, Barber spoke and McDonnell shouted). The bill gets published on Thursday in the Lords, where Labour peer Lord Clarke will try to derail it from the start. Battle draws near. A final thought: A friend of mine with many more union contacts than me suggested a tactic the unions could use. They could go on unofficial strike action, breaking the so-called Thatcherite anti-union laws (as McDonnell suggested today they should do), and then take the fine money out of their affiliation fees. It has a certain seductive simplicity, does it not?